Life is bumping along here. 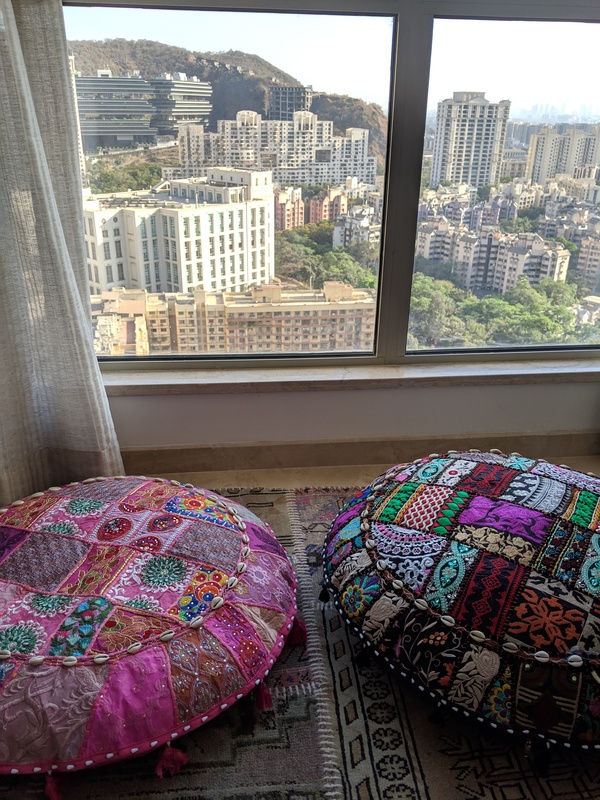 A few evenings ago Benson and I sat on floor cushions sewn from vintage saris, drinking Indian beers and staring out at the city as the sun set. It’s funny: we were so excited to get furniture, but we spend more time on floor in front of the window than our sofa. “What have you learned since being here?” Benson asked. I took a sip of my beer and watched a giant bird swoop past. The conversation flowed until the dirt patch where boys play cricket below us turned from brown to gray and then dark. I’ve learned where to go for custom upholstery work (his name is Bipin and I can send you his number if you like). Benson learned how to operate the microwave at his office. I’m learning new phrases. Indians don’t ask where we live, they ask where we stay. And the accent is getting ever so slightly easier to understand. And they don’t ask how I like Mumbai (and even then, the locals still call it Bombay), they ask how I find it. Beyond the practicalities (which are precious, and we don’t take them for granted), we’re learning how to ebb and flow along with the city. Sometimes things move fast and often they move comically slow. Either way, little is timed how we expect. We’re also learning that while some parts of us are changing, others likely never will. Other than moves (one halfway across the country straight out of college, the other across the world a month ago) and vacations, Benson and I have always maintained a small geographical footprint. Neither of us like driving. We hunker. What that looks like in the US is a church that’s walking distance from our home, nightly shouts across the balconies with our neighbors about how our days went and whose house we’ll meet at for pizza the next Sunday, three restaurants all within a few miles, a gym built into our garage where the door is always open, and one of our closest friends who’s more like family living in our spare bedroom. Deep relationships and few miles traveled brings us immense joy. And while we plan to travel the world a bit more while we are here, our daily life is looking small. Everyone asks about where we’ve explored within Mumbai. Our answer mostly consists of the few blocks surrounding our apartment. But here’s the thing: we are so good with that. Quite small. And praise be to God, getting deeper by the day.